There is an ongoing debate on personalization, adapting results to the unique user exploiting a user's personal history, versus customization, adapting results to a group profile sharing one or more characteristics with the user at hand. Personal profiles are often sparse, due to cold start problems and the fact that users typically search for new items or information, necessitating to back-off to customization, but group profiles often suffer from accidental features brought in by the unique individual contributing to the group. In this paper, we propose a generalized group profiling approach that teases apart the exact contribution of the individual user level and the `abstract' group level by extracting a latent model that captures all, and only, the essential features of the whole group. Our main findings are the followings. First, we propose an efficient way of group profiling which implicitly eliminates the general and specific features from users' models in a group and takes out the abstract model representing the whole group. Second, we employ the resulting models in the task of contextual suggestion. We analyze different grouping criteria and we find that group-based suggestions improve the customization. 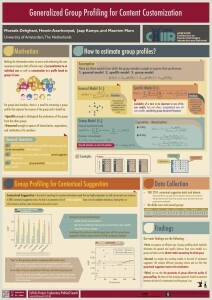 Third, we see that the granularity of groups affects the quality of group profiling. We observe that grouping approach should compromise between the level of customization and groups' size. Mostafa Dehghani, H. Azarbonyad, J. Kamps, and M. Marx, "Generalized Group Profiling for Content Customization", In proceedings of ACM SIGIR Conference on Human Information Interaction and Retrieval (CHIIR'16), 2016, pp. 245-248. [Poster].